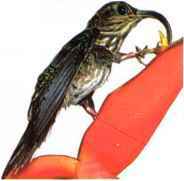 1 his small hummingbird is callcd a hermit because it usually occurs singly and inconspicuously on low perches in damp forest undergrowth. It visits a series of feeding places, sometimes quite far off, to take nectar from flowers, and also eats small insects. • NEST A long cup nest of plant fibers, tapering to a tail, and bound with spider-webs to the inner tip of a leaf or palm frond. • DISTRIBUTION From Costa Rica south as far as Peru. Also occurs on the island of Trinidad. I he downeurving, strong bill of this small hummingbird is designed for probing deep into the curved, tubular flowers of plants such as heliconias. 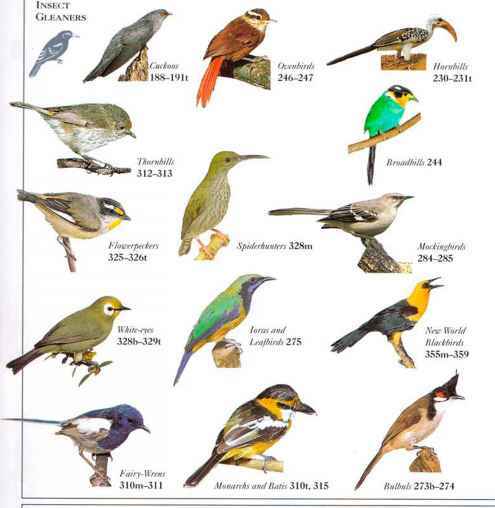 The shape of the bill makes hovering awkward, so instead the bird clambers over the flowerhcads on strong feet. White-tipped Sicklebills occur in rain forest shrubs or at the forest edge. • NEST A long, tapering cup nest of palm fibers, bound to the tip of a leaf with spidcrwebs, often over water. • Distribution Forest zone from Costa Rica to n. Peru.